(1946) Jolly Jug, El Monte | Remains of L.A.
My friend Ari and I drove out to El Monte to visit the Jolly Jug. It ended up being a longer drive than expected, because of traffic, but it was ok because I taught him the car game “Botticelli” and that makes any road trip delightful. 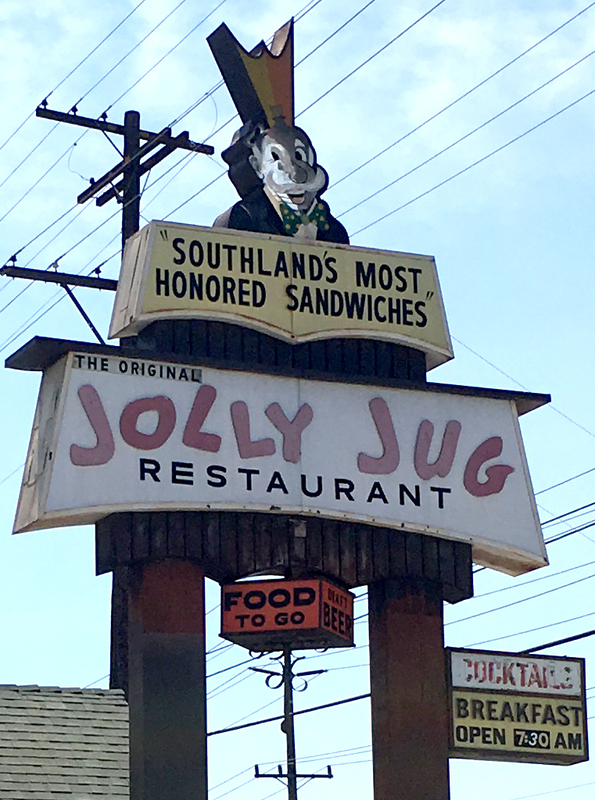 The sign over the Jolly Jug is one of my favorites. It took us a while, staring at it, to notice that the man’s head has a stopper at the top, like you might see on a jug. Nothing else about his head looks like a jug. It’s confusing. -Light brown booths with beige wood panelling on some walls and exposed brick on others, hanging Tiffany-style lamps and lots and lots of decorations. Knick-knacks everywhere, a big display window when you first come in full of turtle figurines plus, for some reason, a couple of cows, a tall thin aquarium with koi, many many beer signs all over the walls. It’s wonderful; it feels kind of like being inside a cozy curio cabinet, or a dollhouse owned by a lady whose only hobbies are her dollhouse, and beer. Every where I look I see something to make me happy. The dining area is to the right of the entryway; to the left is a bar that seemed like a pretty standard place to have a beer and watch sports on TV. 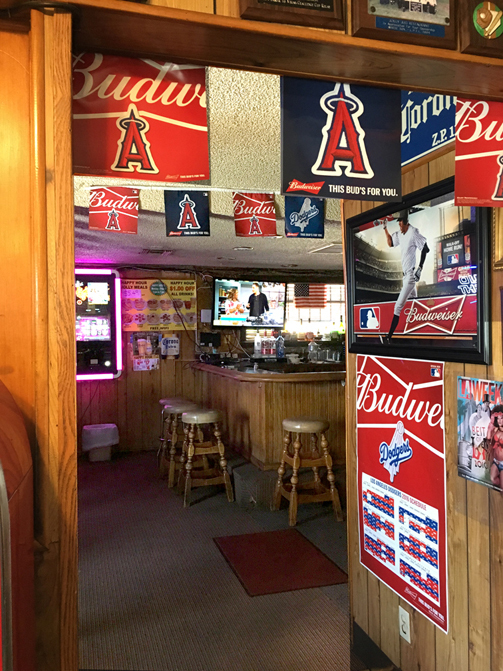 I don’t drink beer or watch much sports, but if I liked those things I’d probably want to come to this bar. 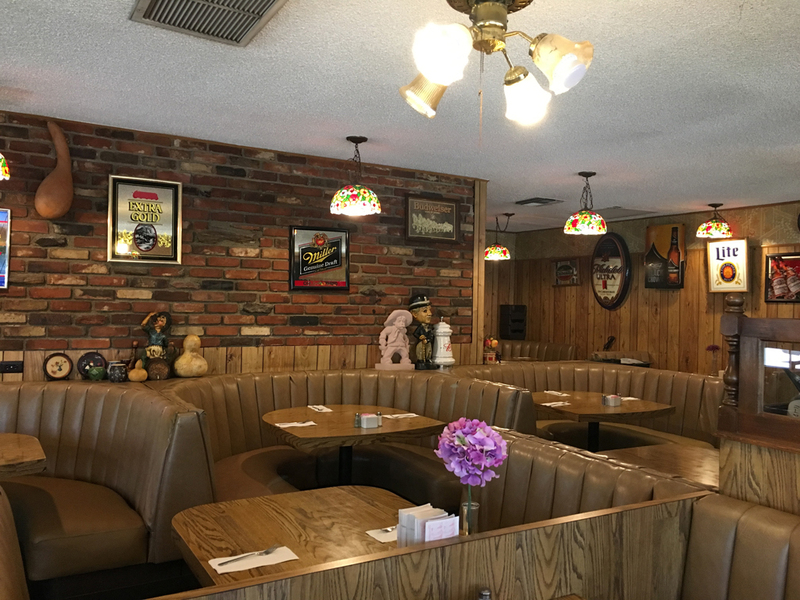 -The waitress mentioned that the place is best known for their beef dip sandwich, but I got that the one other time I came here and while it was good, it was also very heavy. The dip was much more like gravy than au jus. Ari and I split the bbq chicken sandwich and the steak sandwich, but after we’d both eaten our halves of the bbq chicken sandwich I realized the steak sandwich had mayo on it, to which I am allergic, so I let Ari eat my half. It was fine, as I was already pretty full from the bbq sandwich, which was delicious but incredibly messy. I also had a fruit cup, and a couple of Ari’s french fries. I should have checked about the mayo when we ordered. -The Carne Asada Burrito is listed under burgers in the menu. Maybe they decided to put it there because it didn’t fit into any of the other sections and they didn’t feel like making a whole section just for that one thing? Or maybe it is a burrito on top of a burger, I don’t know. They also have a spam & egg burger. -There is a section in the menu titled “Vegetarian Selections.” The last two entires are “Salmon for Vegetarian” and “Grilled Swai (White) Fish.” I do not understand. -There was a sign on the coffee pot that said “do not make coffee it is leaking water.” But the people at the table next to me had coffee, so clearly there is more than one coffee pot. -Some people came in and were seated at the big table in the back, out of sight of the door. A while later a family of four or some came in and looked around blankly. The elderly lady sitting in the booth next to mine called over, “You looking for your friends? They’re in the back I bet; they said it was a party of eight and there were only four of them!” I was impressed; I like to be helpful but hadn’t noticed any of this. -There is a big-head statue of Charlie Chaplin, about a foot-and-a-half tall, in between a huge beer stein and statue of either Winston Churchhill or WC Fields. There are also many statues of squash. -We asked for ketchup and the waitress seemed to pull it out of thin air. She must have had it in an apron pocket or something, but it really did seem like magic. -The booth seat was a little too low for me to reach the table comfortably. This happens to me a lot, as I am quite short. It’s really not the booth’s fault. -Each table had a pretty flower in a vase; ours was purple and particularly nice. About halfway through the meal I realized it was fake, but that didn’t ruin it; it was pretty either way. -The soap in the bathroom smelled exactly like the perfume my Grandmom Ginna used to wear. I realize this is a coincidence but it fit in so perfectly with the feel of the place, I wondered if it smells different to everybody, depending on their grandmother. -A family came in and one of the kids looked so much like Kelly from Bad News Bears that for a second I thought it was Kelly from Bad News Bears, but then I remembered that that movie was made like forty years ago and that guy is even older than me. -The guy next to us asked the waitress if something on the menu came with country gravy or chicken gravy. I never knew there was a difference and I still don’t know what the difference is, but he seemed to and so did the waitress. The answer was country gravy. -They didn’t have any herbal tea at all, but I always carry my own tea bags just in case, which I know is silly but I really only like a couple kinds of tea. I ordered green tea and when they brought the hot water and green tea bag, I snuck my own tea in instead. -There was a little tray on the table full of lottery forms and pencils with which to fill them out. It reminded me of the Keno cards on tables in restaurants in Vegas. We did not fill any out though. 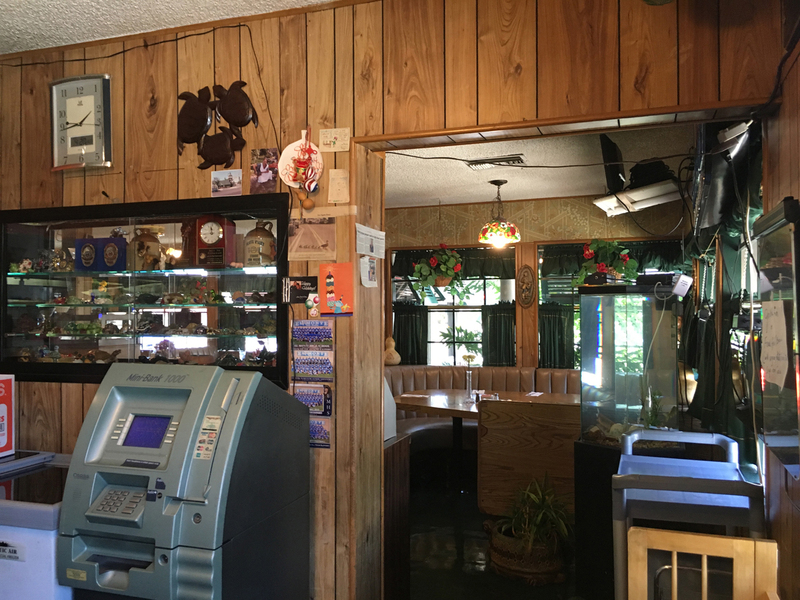 -Some people towards the back of the restaurant had a long, fairly loud conversation about Tylenol, Aspirin, and Advil, and whether they were brand names for the same drug. They agreed that they were pretty sure this was the case. They were sitting way too far away for me to chime in. I probably would have if they’d been right next to us; I do that sometimes. -The hanging Tiffany lamps around the room were all identical; we realized this when Ari pointed out that they were all throwing the exact same patterns of colored light onto the ceiling. -The waitress asked if we wanted dessert and when we said no she smiled and said, “I’ll bring you something anyway!” What she brought, with the bill, was wrapped cookies–fortune cookies and those almond cookies you get in some Chinese restaurants instead of fortune cookies. I’ve never seen a non-Chinese restaurant bring those particular cookies before, but I think every restaurant should. 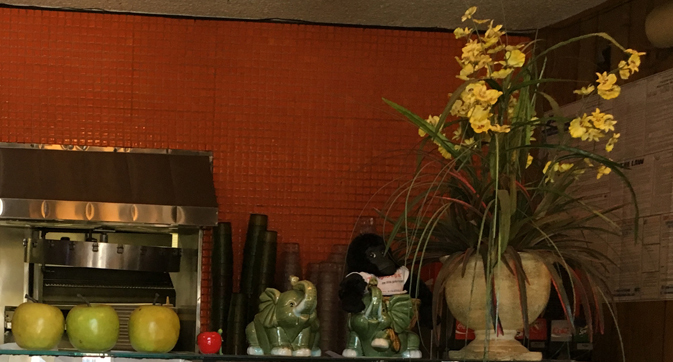 Who I Ate With/Things We Talked About: Ari; the blog “Making Light,” how frustrating it can be to work in customer service, the play A Gulag Mouse at the Sacred Fools Theatre. What Sort of Ghost I’d Expect to Find if I Believed in Ghosts Which I do Not: A group of laughing teenagers, who always ate at the Jolly Jug before heading to shows at the El Monte Legion Stadium. Note: Unless otherwise stated, all ghosts mentioned in this blog died peacefully of old age and then reverted to the age/place of their choosing. Categories: Restaurants | Tags: 1946, el monte, historical L.A., historical los angeles, Restaurants, retro, vintage | Permalink.